Jan Cohen Weiss is the owner of one of Philadelphia’s premier dress stores. Berta Sawyer, a sophisticated salon, is known for outfitting the area’s best dressed women. Jan’s casual, warm demeanor is a disarming complement to the Berta Sawyer reputation of sophistication and high style. Jan’s story continues that after she gave birth to her daughter, Shira, she spent her maternity leave from teaching and worked in the store. She immediately loved the work at Berta Sawyer. Even more, she loved being able to have her daughter with her. Better yet, she loved knowing that when Shira left the store on Castor Avenue, she was being strolled in her carriage up and down the avenue by Jan’s grandparents, Shira’s great grandparents. As Jan describes it, those were wonderful times when four generations of Cohen women lived close, worked close and grew together even closer. It was a great time for her family. Eventually, Jan had her son, Ari, and she continued her extended maternity leave working at Berta Sawyer. Jan never returned to teaching in the public schools as she was smitten by the clothing business permanently. Jan sees a connection between her formal training in education and the work she does today. “It’s definitely helped in collaborating with my co-workers. Jan calls upon her communication skills constantly and taps into her “teacher” abilities to train and organize all the time. What about Berta Sawyer, a Philadelphia landmark for special occasion dressing? “It’s true our reputation has been built on dressing for THE special occasion. We still do that… mothers, daughters, grandmothers alike can find what they want and need at Berta Sawyer. But we’re much more than that. 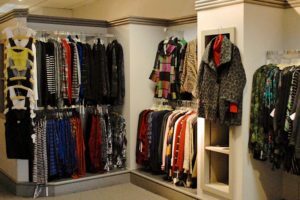 We are a clothing salon that is all encompassing. What does Jan recommend for that starter wardrobe? “That’s easy. I recommend a pair of great fitting black pants, a black skirt,a belt and one layering piece – in color. If you prefer a black dress to the skirt, that’s fine. You can layer just as well with either. You’ll also need a jacket to coordinate with these pieces. Tweed would be perfect. Build upon these separates and you can’t go wrong. We can help you put this together and do it within your budget.” Expert fitting and specialized attention is what Jan Weiss and her Berta Sawyer compatriots are all about. Regardless the occasion or lack thereof, Jan and her crew can fill the bill. Jan really loves what she does. When she’s not working, finishing the details for someone’s growing wardrobe, where does life take her? She is a doting grandmother frequently traveling to visit her grandchildren, an avid reader, and a staunch Eagles Fan. A real pool person, she enjoys soaking up the rays as if to prepare herself for the fall onslaught of fashion frenzy. Above all, Jan Weiss is a committed family person. She puts people first, both in her personal life and professionally. 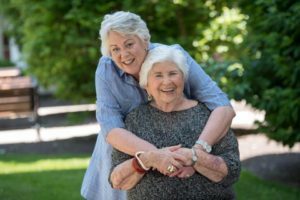 Besides her children and grandchildren, she includes her mother, Lorna and Jan’s partner, Rick, as those most significant in her life. 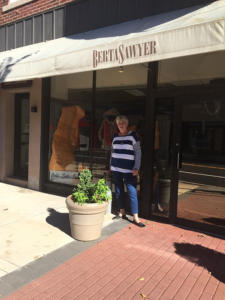 As in all independently owned businesses, Berta Sawyer is a reflection of the person behind it… very real and warm, and exceptionally caring.